The Catholic Position on the RH Law: "If we fall from grace, we have only ourselves to blame..."
"If we fall from grace, we have only ourselves to blame..."
RH bill passage: A humbling moment! 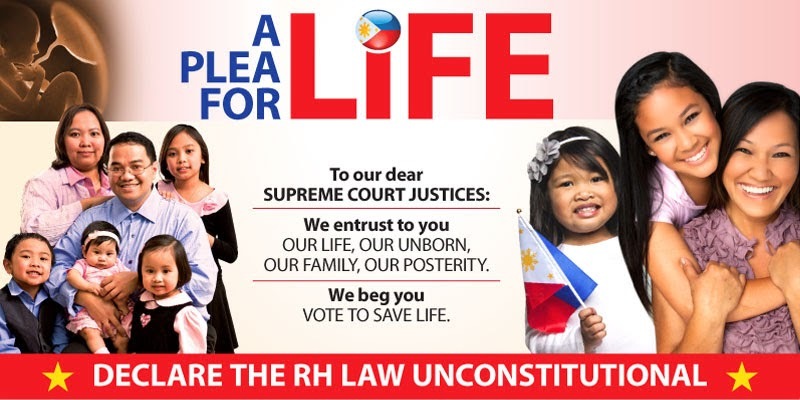 I look at the passage of the Reproductive Health (RH) bill in both legislative houses in the Senate and Congress last Monday as a watershed in Philippine history as it gives us a not-so-true-picture of the kind of people who represent the Filipino people in the Legislature. I have always looked at these people as nothing but greedy politicians who feed on the poverty of our people, blaming even the poor for having too many children, but never blaming themselves for feasting in the pork paid for by the taxpayers of this country. They call our overseas Filipino workers (OFW) as heroes, but even in honoring the OFW, they mostly get lip service from our politicians. I look at this RH incident as a “humbling moment” especially for the Catholic Church and the realization that we Filipinos despite the millions that troop to the Feast of the Nazarene in Quiapo or during the Sinulog Week in Cebu City have become mere Catholics in name. I spent a huge part of Tuesday afternoon before the Blessed Sacrament, asking our Lord, “O Lord, have thou forsaken our nation?” I’m sure that God himself was disappointed and I can only ask the Lord to forgive our Congressmen and Senators for they know not what they do! At this point, it is time for the Catholic Church to get its act together. In this spiritual battle, we have encountered priests and even Bishops who send confusing signals to the Laity about the RH bill. Perhaps the Catholic Bishop’s Conference of the Philippines (CBCP) should seriously consider ways to strengthen our Catholic faith, and openly support the recent moves to create the Catholic Vote Movement so politicians will take notice. 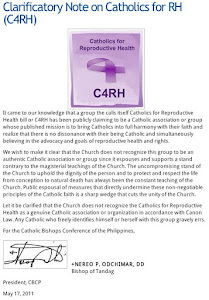 Meanwhile, allow me to take a post RH bill comment from Archbishop Socrates B. Villegas, Archbishop of Lingayen, Dagupan who said “The Reproductive Health bill has been passed by the Senate and Congress through a majority vote. They might have won through the tyranny of numbers but it does not mean that they are right. It is only a matter of time and then we will see more violations of “Thou shall not kill” and “Thou shall not commit adultery” among our families, our youth and children. If the President will sign this into law, he will give us a moral time bomb wrapped as a gift to celebrate Christmas. This law will open more doors to abortion and more crimes against women.” We are recording these arguments for future use. 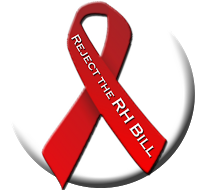 At this point, allow me to congratulate the brave Senators and Congressmen and women who fought long and hard and more importantly, kept the faith and voted against the RH bill. They have fought a good fight, but history will judge their actions whether they are right and we are wrong. One thing is sure… Filipinos nowadays are no longer as religious as they were 25 years ago and if we fall from grace, we only have ourselves to blame. The Greatest Commandment taught by our Lord Jesus Christ is to Love God with all your heart, your strength and your soul… and your neighbor as thyself. But the approval of the RH bill has tipped the scales away from God, whom we should love first, but greed, lust for power and materialism have overcome the people’s Representatives and I’m sure there are many Filipinos out there who are just as disappointed as we are. In an article by Michael Voris, entitled “Suicide by Heresy” emailed to me, Voris says “When a heresy is left unchecked… people’s minds are poisoned. When their minds are poisoned… they actually lose the ability to perceive the truth any longer and they begin to live a lie.” I used this quote because in order to have this bill passed, the pro-RH Congressmen and their supporters used all kinds of squid tactics and even outright falsehood just to have this bill passed and it saddens me that their venom succeeded. Where do we go from here? Divorce? Enough already! Even the Liberal Party issued a statement thanking the Senators and Congressmen “for engaging each other to forge a law that truly reflects the will of the people they represent. We thank an active citizenry that engaged our legislators in discourse as regards the merits of the bill. Through it all, the Liberal Party stood firm in its bedrock principles.” It makes you wonder what those bedrock principles are… the lying, the cheating even during the Congressional vote? How far will the Liberal Party go in its pursuit to keep its power? In Cebu City, the Liberal Party isn’t really a huge party as it has to rely on the Bando Osmeña-Pundok Kauswagan (BOPK) of Rep. Tomas Osmeña. In the Province of Cebu, it is the One Cebu Party that is dominant. But the Liberal Party has something up their sleeves… they can count on the Office of the Ombudsman to suspend Governor Gwen F. Garcia. Hmmm, no wonder the LP’s are not even campaigning in Cebu… not only will they get rid of Gov. Gwen courtesy of the Ombudsman… they also have the PCOS machine! For email responses to this article, write to vsbobita@mo-pzcom.com or vsbobita@gmail.com. His columns can be accessed through www.philstar.com.